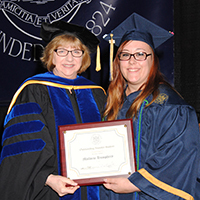 Cazenovia, NY (May 24, 2017) At Cazenovia College's 192nd Commencement on Saturday, May 13, OCC graduate Mallorie Humphrey received the 2017 Academic Excellence Award for Outstanding Transfer Student. She is a Human Services major with a specialization in mental health counseling with a GPA of 3.9 and on the Dean’s List every semester. Humphrey is also a member of the Alpha Chi and Tau Upilson Alpha national honor societies. In the fall semester of her senior year, she completed an internship with Access CNY in a day-support center for adults with chronic and severe mental illnesses—her supervisor described her as "an outstanding student with so much potential to work and be successful in the mental health field." Humphrey's senior research project focused on the importance and effectiveness of complementary alternative medicine and holistic approaches to address physical and mental illnesses. She will continue on for her master's degree in clinical mental health counseling, intending to have her own counseling practice utilizing holistic approaches to improve people's lives.